Dungeons & Dragons’ selling point is that is lets players be and do things they’ve always dreamed of. Dinosaur racing has never been one of those things for me, but if it is for you, D&D’s newest adventure, which launched today, delivers on that very specific fantasy. Tomb of Annihilation is a campaign set on the jungle island of Chult. Although the adventure details fantastic beasts like mandolin-strumming felines, half-gold dragons and a jaguar whose neck spurts out snakes, Tomb of Annihilation’s dinosaur breeds sound more like “T-rex” and “Velociraptor.” That’s okay—you can’t race the snake jaguars, anyway. A pretty substantial portion of Tomb of Annihilation’s first chapter is dedicated to how to race dinosaurs and how to bet on dinosaur races. The city of Port Nyanzaru, a bright, tropical city full of commerce and action, is famous for these weekly races through the city streets. A typical race day, Tomb of Annhilation reads, “has three races: one for four-legged beast, one for two-legged beasts, and one no-holds-barred ‘unchained’ race.” They’re each 300 feet long and span from the harbor to the outer hills. When it comes to racing yourself, the mechanics aren’t as straightforward. It’s possible for players to mount anything from a young Allosaurus to a big ol’ Dimetrodon (the one with the fin on its back). Each Jurassic beast has a different speed and susceptibility to players’ commands. To win a race, players must roll dice every few seconds to see whether they can manage their race dinosaur with what’s called an “Animal Handling” check. Each successful roll contributes to a running tally. Whoever has the most points wins. 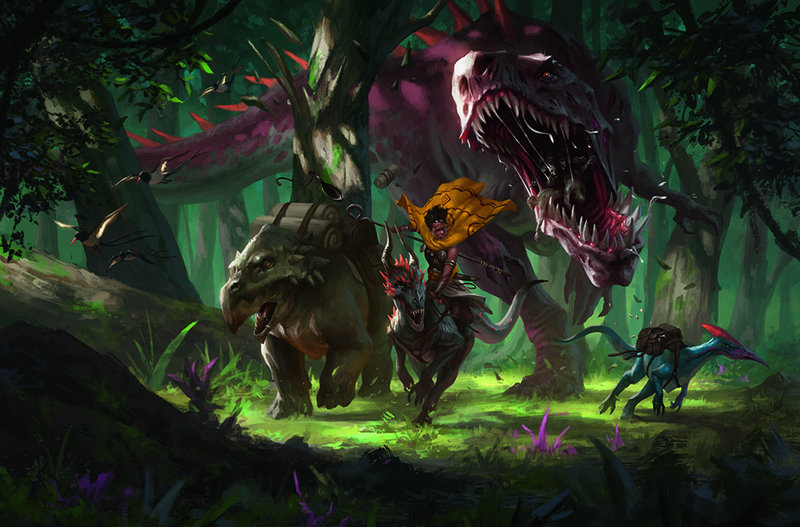 Tomb of Annihilation’s very robust dinosaur racing rules also note that players can attempt to win by “lashing the animal furiously,” but if the dinosaur buckles under pressure, they may be handicapped the rest of the race.